Light Bulb Ball Design Light Bulb BallCustom lanyard are the most popular and economical lanyard we have, these polyester lanyards are perfect for conferences, trade shows or as identification for building entrances. You can choose between one of our basic lanyard attachment free of charge that include an J-hook clip, Lobster clip and Heavy duty trigger clip, and Badge Holder options attached with it. 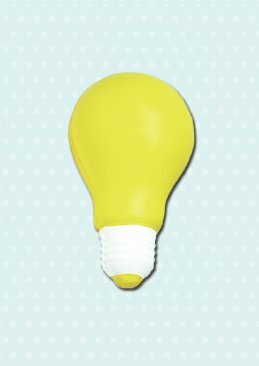 The Light Bulb Stress Ball is great for marketing creative sayings and ideas! These squeezable light bulb shaped stress relievers are custom printed with your logo and/or text making them ideal for your next marketing or internal event. Being inexpensive, fast to print and loved by recipients you simply cannot go wrong. Order online or contact us by phone, live chat or email for more personalized service. You will soon discover why we are known worldwide as stress ball experts! Size - 4" x 2 1/2" x 2 1/4"
What message you would like? NOTE: Logo will be printed in center, File Accepted: JPEG, JPG, GIF, PNG, EPS, PDF, PSD, AI, BMP, TIF, TIFF.